Instead of attempting to produce complex robots that mimic the insect form, researchers have hijacked bugs to turn them into robots. These cyborg insects have varied uses, from spying to search-and-rescue missions. Scientists have observed insects when designing robots, anticipating the knowledge of millions of years of evolution. Insects are the most successful creatures on the planet. Cyborg insects have a number of disadvantages compared to actual robots, such as limited life spans. The advantage is that they have ready-made platforms, avoiding the necessity of making a lot of small parts. They also use less power than comparable robots. One big advantage is that the insect cyborg can overcome obstructions by itself. Why are insects such great contenders to become cyborgs? For one thing, they move with a method of locomotion that's as advanced as most mammals. The counterparts in the control systems between arthropods and mammals is extraordinary. Also, insects have open circulatory systems, and they recover quickly after surgery. Their movement and navigational capabilities make them first-rate cyborgs. People have the idea that insects are simple creatures, but that's not true, as insects are just as complex and adaptable as larger creatures. Researchers want to establish systems, which will observe the location of the cyborg insects and guide their paths toward precise objectives. 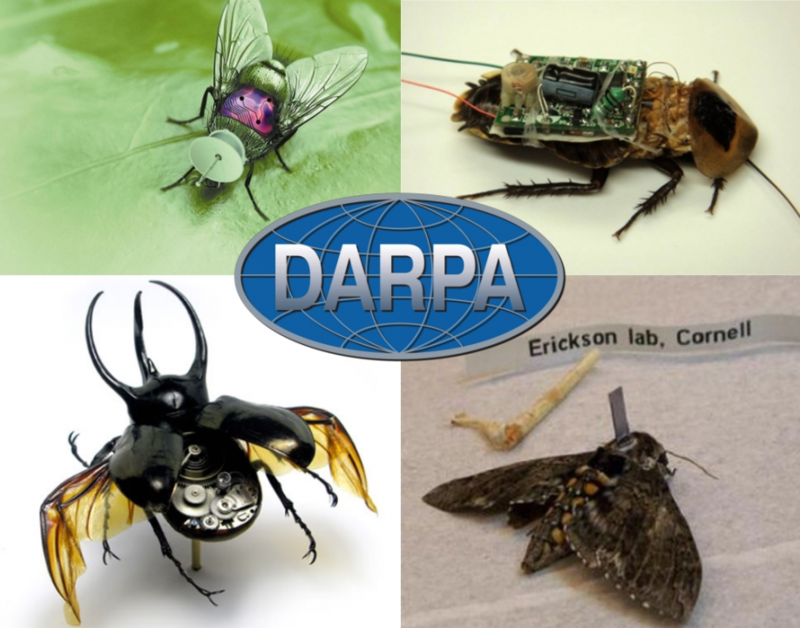 One objective is the military’s use of insect cyborgs to spy. Small live camera-carrying versions of the Predator drones could fly undetected into locations where humans could not go to nose around the enemy. Insect drones are a challenge as there is a problem developing droids that have an energy source that has both low weight and high power. Such devices are achievable in the form of insects, which transfer biological energy into flight. Instead of creating intricate robots that imitate the complexity of an insect that took millions of years of evolution to achieve, researchers fundamentally hijack bugs for use as robots. The Hybrid Insect Micro-Electro-Mechanical Systems program is sponsoring research into surgically implanting microchips into insects as they grow, interlacing the bug’s nerves and muscles with circuitry that could then direct the bugs. This procedure is expensive but it’s economically less expensive than building insect robots from scratch. Recently, uncontrolled roaches were compared to roach cyborgs. Since the controlled roaches could be given random sensory commands to move forward, left, or right, the roach cyborgs automatically surveyed areas far faster than the uncontrolled roaches because the random commands caused cyborgs to move quicker and spend more time away from walls and in open spaces. Because of this research, an “intrusion” of hissing roaches could be released into a collapsed building with each roach equipped with a backpack that produces random commands and contains infrared sensors to detect body heat. Once a roach detects a human heat signature, a rescue team could use the radio signals from multiple roaches to triangulate their exact location and plan the rescue of buried people. These roach cyborgs could explore places too dangerous for people and be used for surveillance and espionage, if outfitted with cameras or microphones. They could be deployed, for instance, into a warehouse suspected of housing criminal activity. Researchers from US and Singapore are working together to control wirelessly the flight of the giant flower beetle. The researchers will control the beetle’s flight by employing a miniature backpack that arouses the beetle’s muscles to control flight. The purpose is to search for survivors after a natural disaster, as well as military uses to control the beetles to carry microphones and cameras for surveillance. Presently, progress is being made in controlling flying insects by using miniature microprocessors, sensors, and actuators, which can be fashioned into millimeter-sized gram-weight wireless backpacks. The backpack consists of a microprocessor and battery pack, which is strapped onto the beetle using organic beeswax, which is harmless and easily removed. Six electrodes from the microprocessor are connected to the beetle's optic lobes and flight muscles and wireless signals influence the insect to take off, turn left or right, or even hover in mid-flight. By sending a signal to the beetle, it could be made to change its direction and the beetle will accomplish the rest. Before a backpack can be attached to an insect, a power source will be needed for the technology. In order for any insect to walk, wriggle, or repair its own cells, it has to convert the food it consumes into molecular energy. When enzymes in a roach’s body breaks down sugar, the procedure produces a byproduct— electrons. Researchers at Case Western Reserve University inserted a wire into a cockroach to conduct these electrons and harvest the electricity. Although the cockroaches only produced a tiny current, enough current could be collected to power the electronic backpacks. If areas of the brain where the bug is making the command determining where it's going to go, it can be controlled subtly. The challenge is that this type of mind control would first require knowledge of how the brain sends these commands. At the University of Oxford, neuroscientist Gero Miesenbock uses genetic engineering, chemicals, and lasers to adjust fruit flies' brains and their behavior. After segregating the parts of a fly's brain, which is responsible for certain behaviors, such as jumping and flying, he engineered flies, in which these brain cells would be sensitive to light. Shining a laser at the flies was sufficient to rouse these actions. All of the work studying insect brains may present some understanding of our own minds. Neural implants, like those that make a beetle flap its wings or a moth turn left on command, may well assist neuroscientists, who study human brain diseases. There are many biomedical people studying Alzheimer's. The concept is to implant a small semiconductor chip in the brain, and then introduce a small electrical stimulus on that part of the brain. Electrical stimulation reduces the brain shrinkage that occurs in Alzheimer's patients, and modifies the symptoms. Improved neural implants could be a benefit with this kind of treatment. Based on the work with insect cyborgs, we can see a wealth of uses in many areas, including Alzheimer research. Manufacturers have the choice of robotic grippers, depending on the handling application and the type of material that is being used. There are four basic types of robotic grippers: vacuum grippers, pneumatic grippers, hydraulic grippers and servo-electric grippers. There are over 450 exhibitors showcasing the latest innovations in robotic, vision and motion control automation technologies. If you want to see your business grow with the times, Automate is the show to attend.